Moving can drain your bank account. Between the price of hiring movers, paying for gas, utility bills, and the cost of your new place itself, the fees up. One thing that you can do to cut costs is to find moving boxes for free. Packing material can be pricey, especially when you need enough to move an entire home. The thought of moving without having to spend money on them is a great idea! There are many places around town where you can pick up moving boxes for your relocation needs. You'll want to pair yournewlyacquired free packing materials withmoving labels.This way, you know right where everything is when you get into your new place. When it comes time to move, free moving boxes will be an awesome budget hack. We're here to help you with ideas on how to find free moving boxes anywhere you can. It may take some scavenging, but you can find enough free moving boxes to carry everything in your home. Although it's possible to find moving boxes for free, check out this list of moving materials you may need. This will help youestimate your costs. The first place one should check is an office supply store. Stores like Office Max and Staples usually throw away sturdy, reinforced electronics boxes. See what they are giving away! The strength of these usually helps to protect your more fragile items. Once you have the clean boxes, check out our helpful guide onhow to pack clothes for moving. Speaking to the employees at bookstores is another good place to search for boxes. Books areextremelyheavy, so the containers used to transport them must be very durable. They don't use baby boxes, meaning that they are all very big. Bookstores often get major shipments about twice a week, and most of these boxes end up in the recycling bin. Most stores are happy to give away their shipment boxes; all you have to do is ask. Also, check bars and restaurants. These boxes transport glass alcohol bottles, and they must be very thick as not to break the glass. The design of these types of containers ensures that your breakables will be safe. The employees at eateries will most likely be happy give you these boxes, as they will end up in a dumpster later. Grocery stores are also recommended places to get a lot of boxes. And best of all: you can pretty much stop by anytime and find packing material there for the taking. If you’re lucky, you can get your hands on heavy-duty banana crates, which areextremelythick. Remember that no matter the thickness of the cardboard, you are going to want to get packing paper. If you are not surewhere to buy packing paper, don't worry! We have a guide for that too. Let’s face it: everyone likes to get free things. When you are moving, the costs can add up once everything said and done. When you combinehiring moverswith the price of your new place itself, costs can snowball. One little area to cut costs is with the free moving boxes available. Boxes are quite expensive, and if you are moving a whole home's worth of stuff, you may be using upwards of 50 boxes. You can find deals online for boxes, but sometimes the lower price reflects the poorer quality of the box. If you work in an office, this task is already very simple. Boxes of office supplies, paper, etc. are most likely coming to your office quite often. These could be a great resource for you, as they are durable and usually have lids and handles. 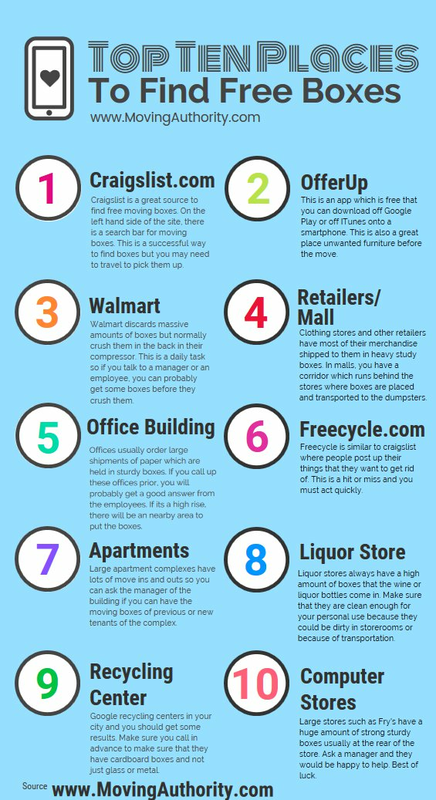 These stores are a great resource because of their containers for shipping glass. These bottles don't break in transit because the boxes are very durable and strong. The same will be true for any fragile items you need to move. These have the most boxes, as they have so many items shipped every day. They have giant industrial recycling bins usually spilling out with flattened, unwanted boxes. But don’t forget to ask the store first. They may even have some in the back they haven’t broken down yet! Connect with these retail stores because they have tons of free boxes. Oftentimes, these boxes held very fragile items. These stores most likely have excess cardboard packing materials as well. This is a quick list of places that you can find boxes in or around town. Sometimes if you call ahead, stores can put boxes aside for you to pick up. At the very least, they could point you in the right direction of where to find their discarded boxes. As stated before, the boxes most likely end up in a large industrial recycling bin. Before this happens, ask if you can take some! Good luck on your free boxes hunt, and get packing!! Check out more tips on moving and finding moving boxes free. Even if you find them in your own apartment complexes, you're winning! Pharmacies such as Rite Aid, CVS, and Walmart almost always have boxes. It may be smart to call in advance for Walmart moving boxes and tell them to save some for you, so they won’t break them down. Place the small boxes into the medium boxes, and the medium into the large, to save space in your vehicle. If you don't have the right size for certain things you may want to use our list ofbest places to buy moving boxes. Moving boxes for free canbe foundalmost anywhere, youjusthave to know where and how to ask! Get inspiration and check liquor stores too. They get similar boxes to the ones bars get, but the ones that liquor stores get have lids. You should also call these stores in advance since many people check here for boxes first. Lastly, check small hardware or home improvement stores in your area. These places often have a manager on hand that can give you the “okay” to take are any free moving boxes. Also, they might just give you a coupon to use for the garden or home improvement items for your place. We recommend that you check your options if your recycled boxes failed you. Did you packimproperly? Or, do you find yourself saying, "Hey,the movers broke my stuff;what should I do after unpacking?" You should be mindful about decluttering. This practice is good for wellness and your new lifestyle in the new home. Now most will agree that moving is streeful, but not being able to source boxes are even more stressful. I am happy that I visited this site and read about places I can access free moving boxes. I never thought of asking for boxes right in my neighbourhood. I am all packed , Labelled and ready to go. You should definitely check out our article on where to buy moving boxes for cheap. You can copy and paste the link below into your web browser to check it out. Free moving boxes are everywhere, you jus have to keep your eyes open and know where to look. Using free boxes is not only a great way to save money, but it also helps save the environment, since you are reusing boxes as opposed to buying entirely new ones. Just because the boxes are free of charge, it does not mean you should take them. You should first make sure that the boxes are sturdy and clean. This is an important thing to check if you want to keep your stuff safe and clean when transporting it to your new destination. If you don’t have any luck in this section, try posting an ad in the Wantedsection of the site. Most people who want to get rid of their boxes will most likely look here first, to see in anyone else is in need of them. You will have to join the local Freecycle group in your area before you can post an ad. Post an ad asking for free boxes and see if you get a response. Most likely, you will. You never know what is just lying around someone’s house. Simply ask retailers in your area if they are willing to give away their used boxes. They will probably say yes, and employees there will be more than happy to help you take them to your car, since it reduces the amount that they will have to break down and take to the dumpster later. Also, you can drive behind supermarkets and look for the bin where they throw away boxes they no longer need. Just to be nice, you should check with the store before taking them. Many office buildings have boxes that they are willing to get rid of. They get a lot of packages every day, and after they are unloaded, there is no need for them to hoard the boxes. Just go inside and tell the receptionist what you are looking for. They will most likely point you in the direction of free boxes. Apartment buildings are a nice place to look for boxes, due to the fact that people always move in and out apartment complexes. Ask the building manager, who will tell you where the boxes are or who you can get them from.